Want Burger with Your Bacon? In a weekend devoted to feasting, we spotlight Slater's 50/50. A new Slater's has debuted in Pasadena. It's juicy claim to fame? The 50/50 burger (half beef, half bacon). If you're going to take something on a bun into the great city of Pasadena, you better know your stuff. After all, the cheeseburger is said to have originated within its borders back in the 1920s. It's home to the almost cosmically loved Pie 'N Burger. It's had a hand in all sorts of culinary innovations, including the Rick's Drive-In Spuderito, (think of a burrito consisting of French fries, hot sauce, and melty cheese). Now Slater's 50/50 is making a home in the Crown City. It's also the restaurant's first LA-area home; there are San Diego, Huntington Beach, and Anaheim Hills outposts. The gourmet mini-chain was born in Orange County, which has had a few burgery triumphs over the years, so look for a variety of fancy-pants meat-on-bun choices (as well as craft beer after craft beer). But the most famous sandwich of the bunch? 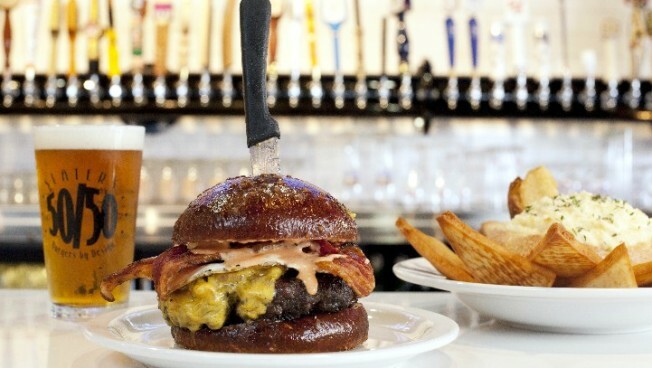 The quintessential 50/50 burger, which is half ground beef and half ground bacon. So, the crispy slices you often request on top of your patty? They're now inside, in the mix, so you'll get the perfect amount of burger and bacon in each bite. The Slater's 50/50 launch is well-timed with Thanksgiving week; if there is anything we like to discuss more than turkey and yam-based cooking techniques over the holiday tables, it is other fantastic and unusual meals we've had and enjoyed. And, figure if the relatives are still around, and you're out and about, you can grab a bacony burger. The only question we still have is this: Would you ask for bacon atop your bacon burger? There are many out there that would. Slater's 50/50 opened 61 N. Raymond Avenue on Friday, Nov. 23.